Our pretty White Organza Bag is the perfect presentation solution for guest toiletries and gifts. With its double ribbon drawstring it looks elegant and luxurious and is large enough to hold three mini toiletries bottles, a handful of chocolates or a small gift. 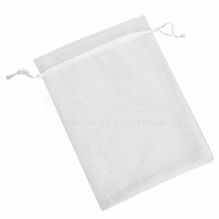 These white organza gift bags would be perfect for packaging up wedding favours or guest treats at an event, for filling and using as table placeholders or for using at turn down time to present a special bedtime treat for your hotel guests. This organza gift pouch is delightfully delicate but sturdy enough to hold amenities. Hang one of these lovely fabric bags from a drawknob, or use a selection of filled organza bags to decorate a tree or hotel feature.